What to do when school results in screams! What a wonderful CHRISTmas time we enjoyed this year, BUT…then it was over and it was time for all the decorations to come down. We were working together to put away “Christmas,” but AbiNoelle was determined to salvage what she could before it was packed away. “Can I just keep this one thing in my room, Mommy?” Before long, that one thing became five and Mommy was forced to insist that it all be packed up until another year. With a cry of true anxiety, she bounded off to her room with a sigh that she “just can’t take this anymore!” Oh, the adjustments of life! So the “Christmas” was down and the snowmen up for January! AbiNoelle has been praying that God will send some fun snow to enjoy soon – afterall, she does want a chance to use those snow toys, but so far it’s just been rainy and too warm. 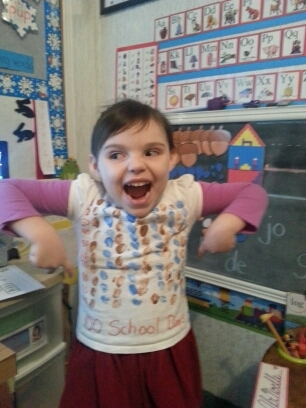 We were glad to get back to the regular school routine, albeit, AbiNoelle was slightly more enthusiastic than Mommy. We had just started Numbers with Mrs. Pintar. 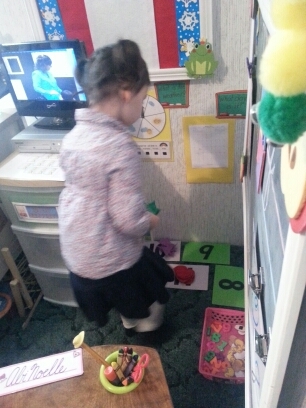 Mommy stepped out of the school room for just a second to put away something, when a scream surged through the house. Mommy rushed to the school room to see AbiNoelle with her hands covering her mouth. That Numbers Time – I just don’t know how much more fun we can have! 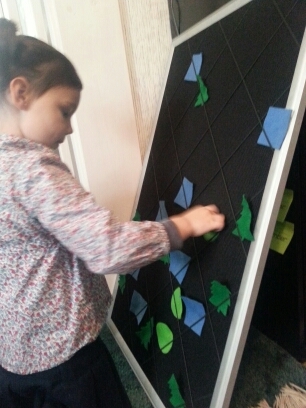 She had such a great time making patterns and counting and matching the amount of felt shapes to the number. However, we did have to talk about how to express ourselves in a slightly less dramatic fashion! WOW! Cursive writing is quite impressive! It’s amazing what AbiNoelle can accomplish when she listens and follows Mrs. Pintar’s exact words! She was so excited to learn how to connect letters and write her very first word all by herself. 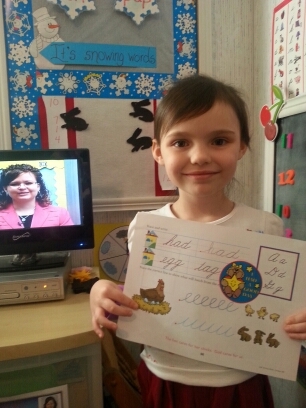 And, of course, we had to stop and take time to recognize her 100th DAY OF K4 School! AbiNoelle loves to paint, so it was super special to be able to take an old shirt and spiff it up to mark this day. We wrote 10 – 100 down the side and used paint to make 10 rows of 10 thumb prints. Counting to 100 by 10s was a breeze and a blast! What a great heritage and special blessing! 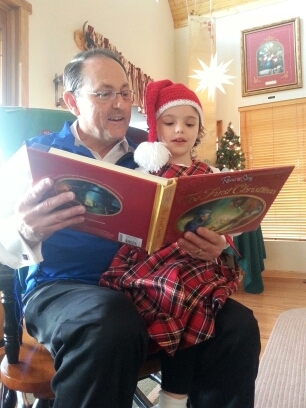 Every year, AbiNoelle and PopPop read Luke 2 together. For a couple of years, AbiNoelle has had Luke 2:1-20 memorized, so she enjoys “helping” PopPop with the reading. Christmas with Grandpa and Grandma also includes the tradition of spending time together as a family and quoting Luke 2. Without question, a precious memory made this year, was AbiNoelle being “an angel” in the Church Christmas Play with all of her little friends. Of course, Mommy had to throw in a little “funny” when she was listening to the girls practicing “Silent Night, Holy Night, All is Calm…” knowing that everything was all BUT calm with that group! On the serious side…AbiNoelle was given the opportunity to quote Luke 2 in narrator fashion during the play – it was precious, special, and never to be forgotten! 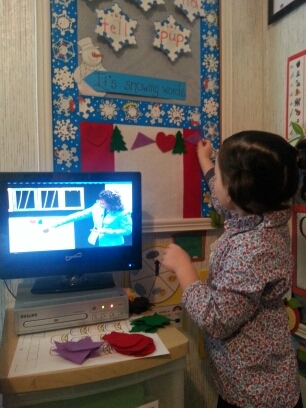 AbiNoelle memorized Luke 2 last year, so this Christmas, she gave to Jesus a birthday gift of learning Matthew 2:1-23. With each verse learned, she added a candle to the birthday cupcakes on our schoolroom board. Below is a video. We trust you will be blessed!